Home » Training & Behavior » How do Dogs Learn? Although we often anthropomorphize our beloved four-legged companions it’s crucial to remember that they aren’t really human. We adore each other and take care of each other but our thought processes are very different. We’ve always been proponents of positive training techniques, and for a good reason – not only is punishment cruel and damaging to our relationship but, as you’ll see, for a variety of reasons it’s wholly ineffective. As social creatures, dogs are heavily influenced by other members of their social group, especially those of the same species. We are a big part of their lives, but through their relationship with other members of their own kind, they learn and develop new skills which we are simply not capable of recreating. Since they are born they interact with their parents and other members of their litter learning and honing their fine motor and social skills that were once essential for their survival. Through their play, although at times it may seem a little rough, they learn how to use their body and senses, hone their prey drive and other instincts that come to them naturally. They also learn how to curb their urges and proper etiquette when dealing with others. They do it by observing what those around them do and reading various emotional cues of their peers, e.g. if they bite too hard their playmate will let out a heart-wrenching whimper signaling them to let go and be more careful next time. Many dogs will try and imitate their peers and elders which can eventually lead them to pick up good habits along the way just as well as bad ones. Sometimes having an older dog around may help with their training, at other times it can be detrimental, and sometimes it won’t matter either way – there is no clear-cut rule for in this case and you’ll just have to see and decide on your own what’s the best course of action for you. 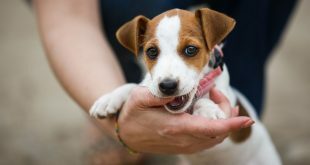 Correctly socializing your pet while they’re still a puppy, especially the first couple of months of their lives, is very important for their later development. If properly socialized not only will they get along better with their buddies on the playground, but both of you’ll have much less stress in your daily routine. 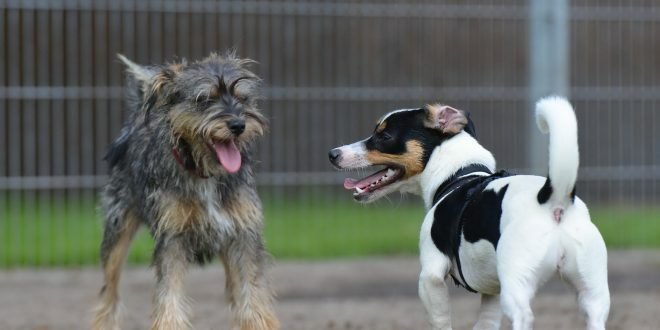 If your pooch is being aggressive towards others – it isn’t not only a mild annoyance but also a very dangerous situation for everybody involved. Some forms of behavior will come to your dog innately. Historically dogs were purposefully bred for certain tasks. This doesn’t mean that all members of a breed will act uniformly do the things that they were bred for. Not every single water dog loves swimming or retriever plays catch with gusto. It does mean that a large majority of them will have an instinctual inclination to do the things that their breed has been designed to do, and be excellent at it with smaller effort put into training. For instance, I could train my darling Jack Russell Terrier Kala to be a retriever or a good water dog, but to achieve that we would have to make a considerable effort than if she were, for instance, a Labrador. To truly understand what makes our tail-wagging companions tick we have to understand where they came from. Although it may seem like a long time to us, a few thousand years since we’ve become friends and allies is an evolutionary short period of time. Dogs are still largely ruled by their more basic desires rooted in them since before our time together. The wild is a harsh environment and everybody had to evolve and adapt in a way that will maximize their chances of survival. That, among other things, means that they have a strong urge to satisfy their immediate needs. They aren’t very good at abstract thinking and long-term planning (as we can observe when they rush headlong into traffic chasing some interesting sensation). Their need for food, shelter, companionship, and fun are some of the things that drive them forward. 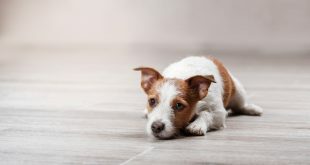 Positive reinforcement methods are based around the fact that we don’t have to physically punish our pets to correct their behavior – instead, under your guidance, they’ll modify it themselves to get the best possible result in a given situation. For instance, if your dog is pulling on the lead and you don’t move in their desired direction you’re effectively making them recklessly spend their energy without making any progress. Therefore they’ll stop doing it because at the end of the day they are at a loss. On the other hand, if you let them lead you wherever they want they’ll know that all their hard work pulling on the lead is worth the effort because they get exactly what they want. And they’ll continue doing it so long as it’s profitable to do so. We all know that the road to a dogs heart is paved with yummy treats, and for a good reason – when death of starvation is a very real possibility the most successful are those who eat whenever an opportunity arises. You stuff yourself until you are full and bury the rest for later. You can observe that even today in the tendency of some breeds, like our wonderful JRTs, to overeat if unsupervised, and bury and guard food and toys if they have an abundance. On the other hand, their eternal quest for evermore tasty food is an excellent motivator for learning new skills. Dogs understand the immediate correlation between action and consequence. They might not see the bigger picture of their actions, like the relation between the food they eat and the allergic reaction that they get some time after the fact, but they get that if they are rewarded with food while doing something that it’s a good and desired behavior. Food, praise, toys, company, etc. are all good stimuli to which they strive. If they are rewarded for something they’ll want to do it more and more. If they do something and it doesn’t produce the effect that they were hoping for the chances of them repeating that same thing are lowered. The key lies in consistency. If they get a delicious treat every time after they’ve done something that you desired they’ll start to associate that action with pleasure and will be willing to do it more, eventually even if you stop rewarding them. Every action has a consequence – positive or negative and behavior is modified accordingly. This type of learning is called operant conditioning and is a basis for many different training techniques such as clicker training. The famous Pavlov’s dog experiment is an example of a process called classical conditioning. 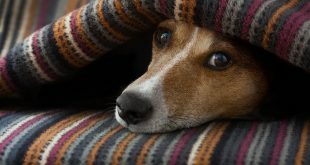 It describes a process of learning in which two otherwise not connected stimuli are paired and the dog reacts reflexively associating them together in an involuntary response. For example, you have certainly observed how your pet gets’s excited if they see you putting on your jacket or hear you opening a can of beans. You probably put on your jacket every time that you take them to a walk – therefore when you are putting on your jacket they think that they are going to another adventure in the great outdoors. If they know that the sound of a can opening means that they’ll have some great kibble for dinner, they’ll get excited whenever you open a new can no matter what’s in it. For them it doesn’t matter if you’re really planning on taking them on a walk or just going on a quick drive to the store on your own, giving them their dinner or just making a salad. In these instances, they associate one sound or a gesture with good things that usually happen when they are produced and it reflexively makes them anticipate the event, or to be precise – the effect of the stimuli. Good trainers and animal behaviorists will take into account these factors when dealing with pets – understanding their process of learning is crucial to understanding why they do the things they do. Both classical and operant conditioning can go both ways. Meaning that the learning process can be associated with positive and negative stimuli. The problem with punishment is that they aren’t exactly sure what they’re being punished for. As we’ve mentioned earlier – their understanding of causality is much more limited than ours. Punishment is discomforting and therefore to be avoided – that can lead them to associate negative things even with those that shouldn’t be viewed as such. You can’t be entirely sure what their motivation at a given moment is so they might start associating bad things with a certain place, person, object, animal, just about anything, even you. What we are saying is that it could make them nervous, damage your relationship and cause more problems than it can solve because it effects on their psyche is so unpredictable. Reward good behavior, ignore the bad and the effect will, in the simplest of terms, be that the good will outweigh the bad – it’ll be better for them to behave in a way in which they profit than in a way in which they don’t. As we’ve discussed earlier – we must be very precise with dog training. Reinforcement must be dealt with in a second since the action occurred or they won’t be sure what they’re being rewarded for. Not all dogs have the same capacity for learning. And that’s OK. In that regard they’re just like us – everybody has their own pace and we have to respect that, be patient, supportive and full of understanding. They’ll get there eventually we just have to be persistent. For a more extensive read on the subject and excellent tips for training your beloved pooch, I recommend you the fantastic Excel-Erated Learning: Explaining in Plain English How Dogs Learn and How Best to Teach Them by Pamela J. Reid and How Dogs Learn by Mary R. Burch and Jon S Bailey. We’d like to hear your thoughts on the subject in the comments below. My 6 year old female has lately been attacking our 12 year old female they both are JRTs and we’ve had them both since they were each 8 weeks old, I have a dog therapist coming to help us on Jan 7, but what can I do to stop the younger one from attacking the older one. The older has always been the alpha in the home and now the younger one wants to attack her and it has caused the older one to get stitches. Please advise me. Help. Thanks for your marvelous posting! I quite enjoyed reading it, you can be a great author. I will be sure to bookmark your blog and will often come. I especially liked reading about living in the moment – this is me to a tee and I wish sometimes my Pawents would understand this better! Hi Morrie, Kala (the Happy Jack Russell) here :) My humans also need those reminders so when I see them worry about something that already happen or something that might happen, I take them out, bark at them like crazy and demand hundreds of sticks being thrown. And then when they see my crazy fetching face they are immediately better. They are so lucky to have us in their lives.